Domain name is the prime requirement of any business or blog to have an identity on the internet. It’s the unique name of your site/blog. For example, the name of the blog that you are reading right now is HostLater.com. So HostLater.com is the domain name of this blog. To have a domain name, you need to buy one from domain registrars. A domain registrar is a company that allows you to register your desired domain name. There are thousands of domain registrars out there. But you need to be careful while choosing a domain registrar site. You should check the features, support, pricing, security, reliability and renewal rates of the domain name providers. To make things easier, I am going to share a list of 7 best sites to buy a domain name in 2018. All of these sites are trustable and reliable. Namecheap is the cheapest domain name provider. You can buy a domain less than $10. It also offers shared hosting, reseller hosting, email hosting, VPS Hosting, and Dedicated hosting. Though it’s not a good idea to buy hosting from a domain registrar, you can try its Shared Hosting for new sites. Namecheap provides 24/7 customer support. You can buy SSL certificates from Namecheap at very reasonable prices. Huge and reliable DNS network. Popular and inexpensive SSL certificates. 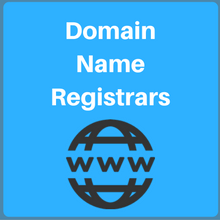 GoDaddy is the largest domain name registrar with ICANN-accreditation. It also offers web hosting service. It was established in 1997 as a Jomax Technologies which became GoDaddy afterward. It sells e-business related software and services. You can buy a domain name from GoDaddy as low as $0.99. But the problem is, renewal price is a bit higher than other providers. Extra names at affordable prices. Award-winning 24/7 customer support and sales. Organized system and attractive offers. Domain.com provides an easy and inexpensive way to buy your favorite domain name. It offers all the main Top Level Domains (TLDs) and more than 25 Country Code Top Level Domains (ccTLDs). You can start your online business or blog at just $9.99 with Domain.com. After registering yourself with Domain.com, you will get access to any additional features at no extra cost. Transfer lock featured to prevent transfer of domains. URL forwarding to redirect domain to other URL. Email forwarding to other email addresses. DNS controlling to retain resistor. Name.com has a good online reputation for buying domain names and web hosting. Name.com provides short, unforgettable and appropriate domain names for your website. It commits to providing world-class client service. It is an ICANN-accredited domain name registrar. In addition to affordable prices, it also offers quality features. Name.com is a part of Rightside, which is a public domain name organization. Deals in premium and expired domain names. 1&1 is another well-known affordable domain selling website. The first year cost of the domain includes all the exclusive offers on web hosting plans. All the 1&1 domains include one email account with 2 GB space and mail forwarding. There is a free private domain registration to protect your specific info. It also offers Linux and Windows Hosting along with Virtual & Dedicated servers and E-Commerce solutions. Unlimited subdomains & new domain extensions. Advanced DNS administration and SSL certificate. Secure network to protect data. Active customer supports along with multiple year registrations. Register.com is trusted by many as it operates millions of online businesses and blogs. It was founded in 1994 and became the best domain registrar with lowest prices offered. Its products include – Domains, Websites, E-commerce, Hosting, Email, SSL, and Online marketing. Register.com provides all the necessary tools that businesses need to create and handle their online presence. Consolidation of accounts through domain transfer. Domain expiration protection up to one year. Private Registration by paying small extra amount. Excellent customer supports along with attractive offers. DreamHost is another recognized domain registrar for buying domains. WordPress.org officially recommends its web hosting services. You can buy your domain at the price of $11.95 which is little costly as compared to others. But the service offered by DreamHost are great as you need not compromise on any feature. You also get an optional domain locking and forwarding feature included in domain registration. There is an extensive list of domain buying websites in the market. But I have just sorted out the 7 best domain buying sites to help you take the decision. The names mentioned above have all the essential features which you need to start your business or blog by acquiring an exceptional Domain Name. Among these few also, I will suggest Namecheap.com for affordable pricing and Dreamhost for both domain & web hosting. Hope this post helped you to buy a domain name for your blog or business.